I have fished with Andrew annually from 2015. That means a lot of time spent on the water and a time that has resulted in us becoming friends. 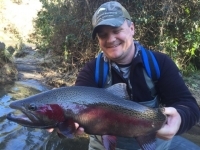 Andrew is outstanding in his field – his knowledge of waters both local and back country is second to none and he always goes the extra mile to get your fish. Every day’s fishing with Andrew has been memorable and I look forward to many more. 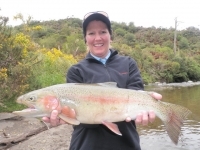 In addition to fishing knowledge you need to have a guide that gives you confidence that you will be safe. Andrew always delivers on this. I wanted to thank you for a fantastic 2 days of fishing. I could not have asked for anything more from our time together. You put me on lots of fish, considerably improved my casting, showed me a couple new techniques, answered questions about your country and we had a jolly time together. Hope I can get back again some time to fish with you. Best of luck with your new child and I wish you all success. If you are looking for a successful and especially fun fishing experience around the Taupo region of New Zealand, Andrew is hands down the guy to call! In hopes of some last minute fishing success before our trip ended, my husband and I connected with Andrew and he got back to us straight away and two days later we were on our way to the river where we caught some beautiful fish, were offered excellent advice and better yet a lot of laughs. I think my cheeks were hurting from smiling so much from all the fun we had on the river. We had time for only a half day out with Andrew and if we could had stayed around for longer we gladly would have done so. 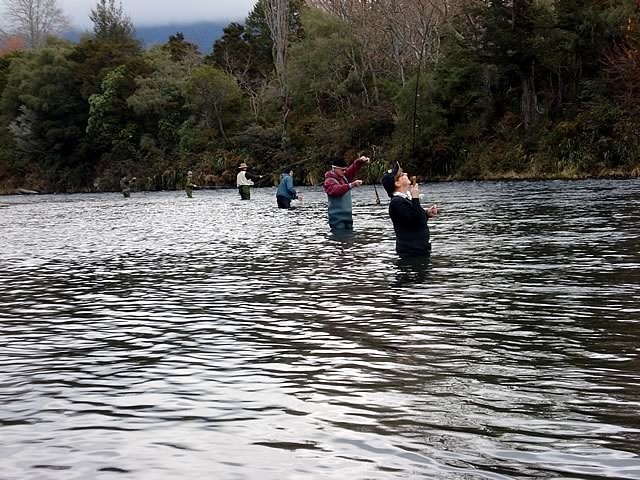 In the morning we were on the Tongariro, he pointed us towards eager fish and taught us a thing or two we’ll be grateful to continue to put to use in our fishing at home. The best part of hiring Andrew as your guide is not only his expertise but his gracious advice and sincere desire for your continued success in fly fishing throughout New Zealand. He offered great advice and many valuable tips that has us excited and already planning our next trip back. We have a great story to look back on of good fish, witty jokes and a beautiful river that we will be thinking on for years to come, thanks to Andrew. When you hire Andrew you’re investing in a quality trout fishing experience, gained knowledge and a time on a river in what might be the most exceptional place in the world. Thanks Andrew and I’m sure we’ll be calling you again someday when we’re blessed enough to come back to beautiful New Zealand! 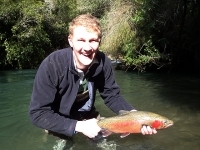 I’ve fished the Tongariro and surrounding rivers for over 15 years, and thought I’d seen it all. 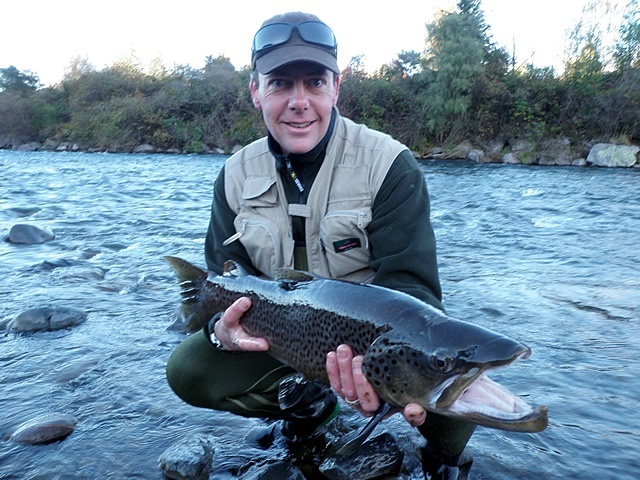 Sure, the rivers change from time to time after a flood, but there aren’t too many other surprises for a Taupo angler, right? My most recent day out with Andrew in August 2015 showed me how much I still have to learn, and more importantly, how well Andrew understands the fishery. Andrew took me to a couple of places that I’d literally driven past for many years (but never fished), showed me how to read the different kinds of holding water, how to approach each pool and run, and shared a couple of his secret flies and rigs. We caught many fish, but more importantly I learned a lot from him on that day. It’s reinvigorated my interest in the winter fishery, and I’m looking forward to trying Andrew’s strategies in a few other rivers on my own. A day with Andrew is truly an investment, regardless of your experience. 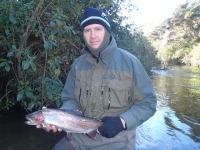 I recommend Andrew without hesitation, he’s Taupo’s #1 trout guide. Just wanted to say thanks so much for the absolutely outstanding hunting trip last week that Samuel and I had with you. Luckily there are quite a few deer here as Samuel missing his first shot didnâ€™t matter in the end, as he nailed his first deer about 30 minutes later (the poor guy’s heart was beating at about 200 and his hands shaking like a leaf). Man!. we now had plenty of venison to take back to the family, yeehah. If any prospective hunters want to talk to me that’s allgood 021953819. Just got back to reality after an amazing days fishing with Andrew on the Hinemaia, it was easily my most successful and enjoyable day on the river. Andrew put my Dad and I onto fish throughout the length and breadth of this little river, I can safely say I well and truly lost count of the fish we hooked and landed! Cheers Andrew for a stunning day on the river, hard to think we could ever top that day but canâ€™t wait to try with you next time we are in town. Besides the fishing his sense of humour and personality is a pleasure to be around and thus has given us many happy memories to treasure and an enormous amount of laughs were exchanged during our 3 days guiding with Andrew. Essentially, this trip to Taupo was a last holiday before we start our graduate schemes with property firms back in the UK having just graduated from University in July. 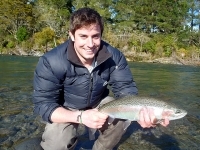 During our two week vacation we were primarily fishing the rivers running into Taupo, as a result we caught just short of 60 fish on four of the different rivers between the two of us and without doubt this success would not have been achievable without the support and generosity that Andrew gave to us throughout our trip. 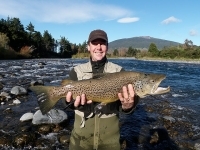 Undoubtedly the fishing in New Zealand is far superior to any fishing that can be obtained within the UK and therefore we were prepared to travel 18,331 kilometres to fish the spectacle New Zealand has to offer. Andrew, we will be back very shortly and thank you ever so much once again for a truly memorable two weeks. 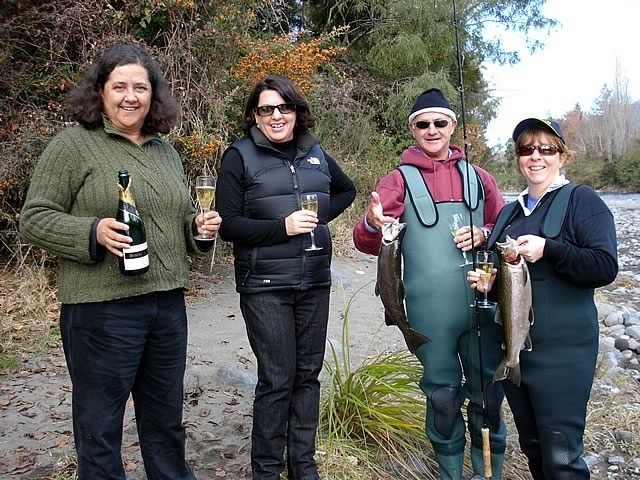 No holiday on earth can ever match the delights and excitements that New Zealand fishing has to give. 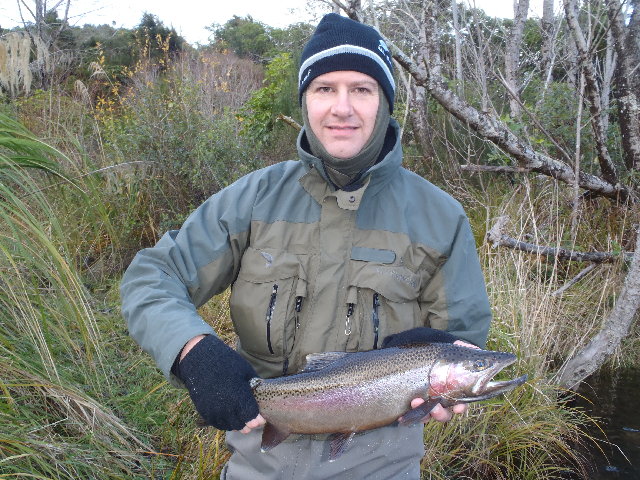 I’ve been fishing the Taupo region for about 7 years now and have used several guides in that time. For the past 2 years I have used Andrew Christmas and have not tried anyone else since because, quite frankly, I think I have found the best guide! I usually visit for a few days at a time and by using Andrew at the start of my visit gives me a valuable update on the rivers in the area – and he is one guide who seriously knows his stuff. I have yet to fail on any of my many trips with him, and have caught some cracking fish both on the Taupo rivers (Tongariro, Waiatahanui, Hinemaia, etc) and at Lake O (it felt great to catch seven 5lb-plus fish when everyone around me was catching nothing at all). A full day fishing can be hard on the body but Andrew makes sure there is plenty of food (excellent catering!) and he’s very relaxed and the type of person you can have a really good laugh with – he has a great sense of humour which is crucial in making the day go so easily. 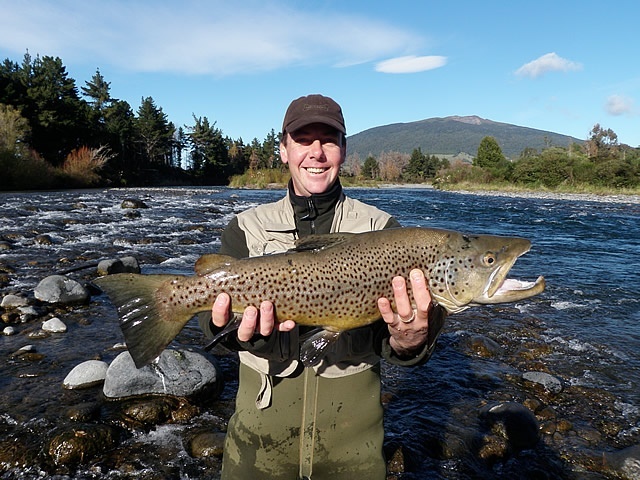 I would heartily recommend trying Andrew first – there is a very good reason why he’s the busiest guide in Taupo, and it has everything to do with his ability to put you onto the best fishing. I will definitely be using Andrew again on my next trip to Taupo. 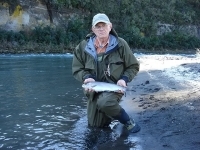 I would like to thank Andrew for the wonderful two days of fishing that I spent with him on the Tongariro.Â It was one of the best trips of my life and I owe much of its success to his expertise and company.Â Fishing with the best guide on one of the top rivers in the world yielded many impressive fish including the fish of a lifetime- a 10lb brown.Â We fished all types of water, used a variety of different methods, and, most importantly, had a great time.Â I have fished many of the top rivers in the world and can safely say that the Tongariro River is my favorite. I canâ€™t wait to return next year to see what else Andrew has up his sleeves and show my fishing buddies how good fishing can be! My new wife and I recently spent our honeymoon in New Zealand. We had booked with another guide ten months in advance and we found out the day before our first day of fishing that he would not be able to make it and that Andrew would be our guide. While we were at first frustrated, it turned out to be a blessing in disguise. On short notice, Andrew was able to plan our days, organize our gear and schedule quad bikes and a helicopter. Within an hour of being notified that he would be our guide, he had every detail arranged. It was quite impressive! He took us to three very different locations – each with beautiful scenery but diverse terrains and views and each providing successful fishing. And while the fishing was great, Andrew’s patience and refreshing personality were even better. 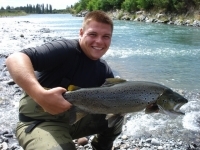 Andrew is not only a skilled angler, but also a naturally talented angler. 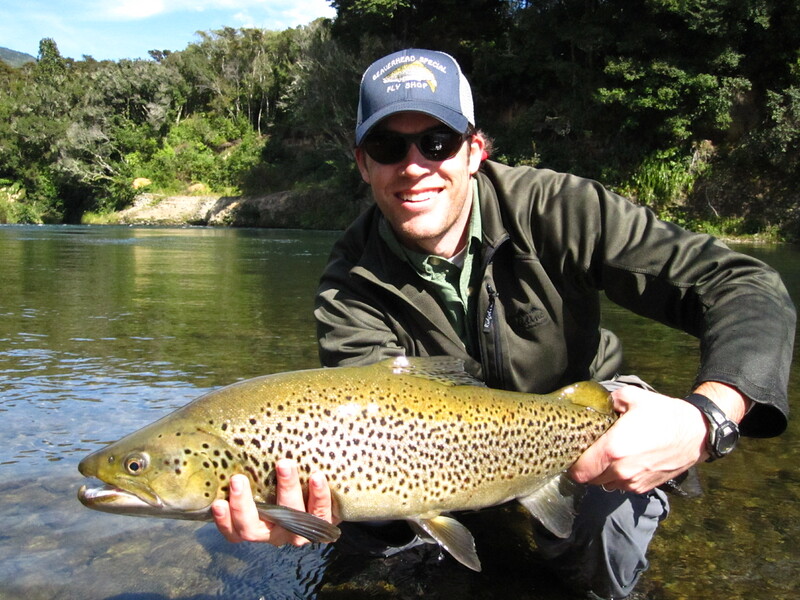 He is extremely knowledgeable about New Zealand, the backcountry, and it’s pristine rivers. 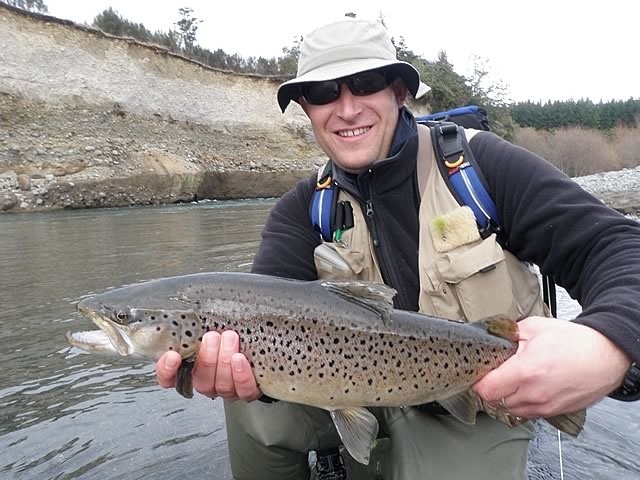 The weather altered our third day of fishing and Andrew accommodated that by adjusting his schedule to our availability within our itinerary which was just one of many examples of how Andrew went out of his way to make our experience the best possible. We are already planning for a return trip to the South Island in two years – but only after stopping on the North Island to have Andrew guide us for 2-3 more days. We have fished quite a bit but we learned a lot from Andrew in our three days with him and we will never forget the experience he provided for us. Thank you, Andrew.for making our New Zealand fishing experience more than we could have asked for! Thanks for the fantastic 3 days of guiding for Dad and myself. We had a great time, caught some beautiful fish and learnt heaps.Â Dad had never fly fished before, but I think we have another convert thanks to your patience, humour and extensive knowledge. Wonderful experience, highly recommended. Look forward to coming back soon. 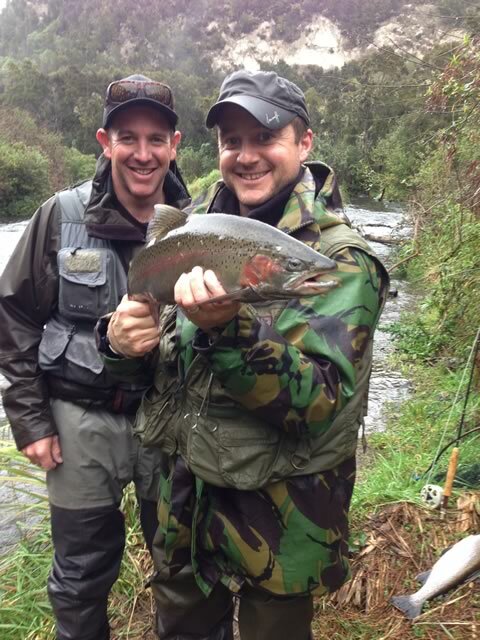 After being on the river with Andrew I now understand why he has a reputation as â€˜The Top Guideâ€™ on the Tongariro. He showed me where the fish were and how to catch them. Not only did I catch 8 fish including two Brownies of 7.5lb and 6lb, but I also learnt new techniques and skills that will help me in the future. His knowledge and patience are unsurpassed and mixed with his great sense of humour make a day with Andrew totally awesome. I‘ve been an avid fly-fisher for over 12 years now. 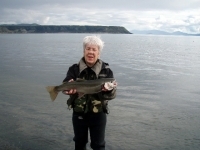 I have fished the rivers and lakes of the southwest United States and in Canada. 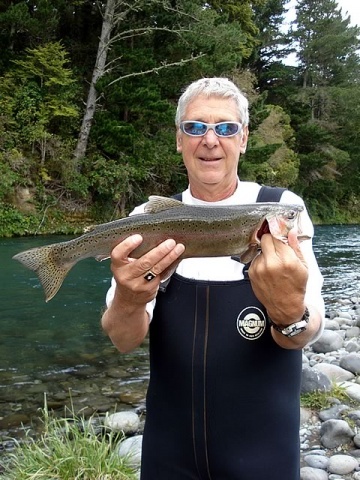 My love for fly-fishing has enriched my life and never had it been more enriched then fishing with Andrew Christmas in New Zealand. 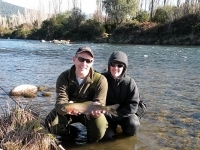 My fiancee and I planned to fly-fish guideless while visiting the Taupo area, until we heard of “Christmas on the River”. We were told that booking Andrew was a must for a great fishing experience. They were right, and I’m so glad we found him. We landed the most beautiful trout we have seen. They were big too. It was awesome! Lori and I agree that the day we had with Andrew was the highlight of our month-long vacation. We thank Andrew for creating that with us. I have fished with many guides in my day and I know that it takes a special skill-set to do it well. Not only can Andrew find you fish but his personality enhances the fishing experience as well. He’s a cool guy! 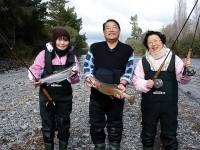 On arriving in Taupo, I asked several sources for a good river guide and the same name came up each time. Knowing how valuable local knowledge is, I booked Andrew Christmas for a days fishing. After the morning session, having landed over 10 hard fighting bullets which Andrew assured me were Rainbows, I was a very happy Scotsman. 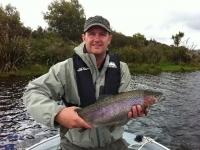 Andrew’s knowledge of the river pools and runs accounted for 99% of these fish, I like to think I fluked one on my own! After lunch, Andrew took me to one of his ‘secret’ places, a cracking little spot which tested my casting ability, or lack there of. But Andrew was on hand to retrieve my fly from a tree, and falling into the river at the same time much to my amusement! 🙂 The day culminated with a flash of a mouth and the 2 of us shouting like kids after Andrew netted the 8lb monster brown which gulped my Hares Lug! I would strongly recommend Andrew to all from complete beginner (he tells me he loves them) to seasoned expert. His knowledge and experience of the river (and pubs) is second to none, and the banter is even better. Cheers mate, I shall return! When I wrote to inquire about guiding for a day with Andrew and telling him we were a family of 4, I was skeptical that he would be able to accommodate us. 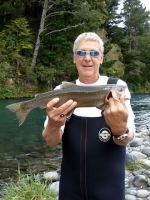 With only one experienced fly fisherman amongst us, it would be a tough ask. But when the day came, he showed the patience and professionalism of a true guide and made the day one of the highlights of our trip to NZ. I have fished around the world and I will say that Andrew is an outstanding professional. I will be returning to NZ and Andrew has already been primed of our return. 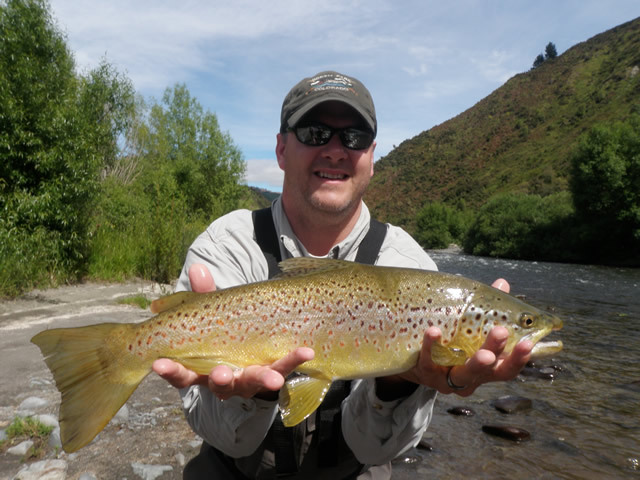 In my thirty years of flyfishing Andrew is, by far, the best guide I’ve come across. Andrew is professional, personable, patient and knowledgeable. He knows the water and has a keen sense for locating fish. The novice, as well the experienced fisherman, will benefit from his guidance. It was a total pleasure to fish with him. I want to thank you for one of my greatest fishing experiences. I have fished in Mexico, Canada, Alaska and the USA and this was the highlight of my New Zealand vacation to be able to fish with you for an afternoon. I only wish I could have done a full day with you. It was a real treat to fish with you and would recommend you to any one. My day on the river with fly fisher (guide extraordinaire) Andrew Christmas was magic. Not only is he a great guy, he has a superb personality and a droll wit. He revealed an amazing knowledge of all things piscatorial, took me to this beautiful (drop dead picture postcard stuff) stretch of the Tongariro river and we fished. Without a doubt I had a great time, we caught 5 fish, 2 of them trophy trout. Not only had Andrew arranged my accommodation, provided some gear, he even made arrangements for one of the fish to be smoked! The guy will be a legend if he keeps his wits about him, perhaps he is one already? Great experience! 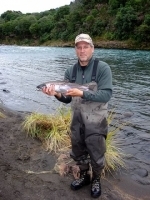 Andrew was knowledgeable in both the fishing and the local area. We received excellent door-to-door service and didn’t need to pack anything but the camera! We will be recommending fishing with Andrew to anyone we know visiting the Taupo area. I have been out with Andrew a couple of times – and I will go out with him again at any opportunity, he’s a great guy and a great guide. On the girls weekend – one honorary girl with us – (not that normal for girls to be on the water apparently) he was very patient, we caught three fish, all keepers, and it was our first time out, and he produced an absolutely fabulous lunch – trout and artichoke pie and a bottle of bubbles! The other fishermen reckoned the only reason we caught the fish was the pheremones. I had such a good time and enjoyed it so much that I took my family back at the start of our family holiday. July – freezing cold – this time there was Brendan (husband) and our 21 and 18 year old daughters. Again success – 3 trout and beautifully smoked and vacuum packed to take home. The 18 year old didn’t really take to it (too cold) but it was a big hit with everyone else. We’ll definitely be back when the opportunity arises. Where else can you relax, enjoy magnificent scenery – snowy mountains in the backdrop – get into the rhythm and catch a feed !! It’s fab – highly recommended. Nice Guy and Nice trout fishing trip. 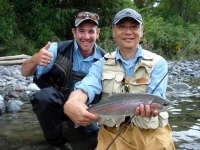 We found Andrew through our Apartment Manager, they told me Andrew is good guide for both fishing and hiking. We catch two fish within two hours, one is 1.5 kgs and one is 2.5 kgs. Both of us very exciting!! Andrew, we will come back soon. 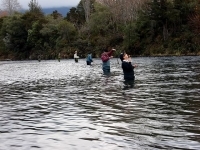 I asked locally (Taupo) who a good guide was and Andrew was mentioned, we had 3 people fishing and Andrew handled us very well and knew the river very well. We ended up catching over 15 fish that day and I have used Andrew again since that and have always caught fish. 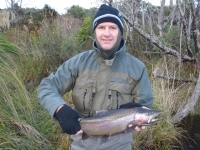 Since purchasing Burkes Backpackers in November 2007, Andrew has become an invaluable operator for our guests. The majority of our guests are international backpackers who are on a budget. 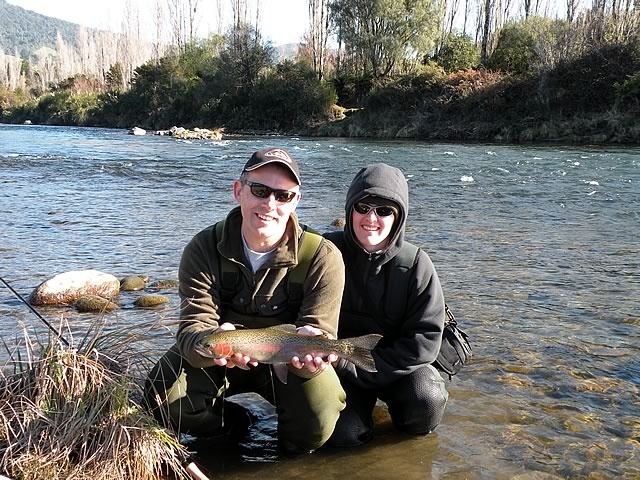 Therefore, fly fishing is out of most of their realms in terms of an activity here in Taupo. However, Andrew has introduced a product that not only works but is getting great feedback from all of the guests that we send with him. All of them so far have come back with at least one fish having hooked a number more and have thoroughly enjoyed the unspoilt places that Andrew has taken too as well as learning, what is for most of them, a totally new skill.